A VIDEO of the late music superstar and national hero Oliver Mtukudzi promoting the Cape Town International Jazz Festival (CTIJF) scheduled for March 29 has appeared online, stirring people’s emotions. 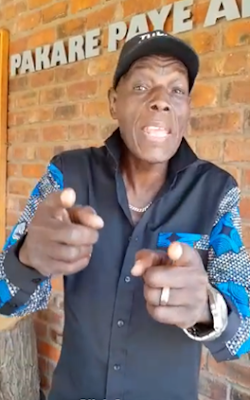 Posted on the official Tuku Music social media pages, the video seems to expose cracks in the late musician’s family as it is promoting the South Africa gig at the expense of the Selmor Mtukudzi-led gig set for the same day at Andy Millar Hall. The video has seen the late musician’s followers being taken back into mourning, remembering Tuku’s music while others take it as a plot to scuttle the scheduled Selmor gig. After the musician’s death, a number of events were held as tribute to him with Selmor and her sister participating at one of the events in South Africa. They announced that the late musician’s band, the Black Spirits, will participate at the festival. “We are still trying to come to terms with the loss of our pillar of strength and as such, we have not engaged any organisation or individual to organise, plan any events on behalf of and for the Mtukudzi family here in Zimbabwe and elsewhere. “We would like to distance ourselves from any events or gatherings that are being held in the name of the Mtukudzi family as we are still grieving. “All events that have the endorsement of Tuku Music and the Mtukudzi family will be posted on the official Tuku Music social media pages, the first such official event being the Cape Town Jazz Festival that Dr Mtukudzi was meant to have performed at this year and the show will now be a celebration of his life in music by his backing band, the Black Spirits,” read the message. CTIJF management confirmed the line-up for the commemorative tribute, billed as Tuku Music: A Celebration of Oliver Mtukudzi’s Life through his Music, will fill Mtukudzi’s original slot on Saturday, March 30.